Would take a lot of batteries and solar panels to push a boat of that displacement around... Or do you mean the little nicotine thingies? Yup, I've got one. I thought it was great, the cat's meow. It took the edge off when I was in an environment where smoking wasn't allowed.....I really enjoyed bucking the system with that thing. It satisfied my physical habit of smoking and it satisfied my nicotine craving. Do I use it any more? No...I quit smoking a couple of weeks after buying the thing. I didn't even use up one nicotine insert. Curious, why are you interested in the topic? Because I cant quit 20 years of it .I have got to QuitTTTTTT Period. X2 I would like to know. It worked, Gives you the nicotine. I used it to think I would quit smoking after a while. Spent a 100 bucks on accessories, did the drip method. Haven't had a cig since, going on 5 months. Cold Turkey. I don't miss them, but still get the urge eevery now and again, I am to far into it to go back.. I wanna be a quitter. Good luck, you have to decide what you want them for....I look back and at all those gimmicks ( patches, E Cigs Lozengers..etc)..they just prolong the agony....and make others money, keep your money, just quit..just my opinion. Good luck, go cold turkey, you can do it! You'll see what you are made of mentally. If I can quit and make it through some real tough times in the past few months with out one, you can to! They work great, my wife smoked 30 years and put them down for the elctronics, no stinky smell and no harmful chemicals that they are stating as of yet. I smoked back in the day and now and then would smoke when I'd drink but now only a electronic one. I have been using the Joye 510. The cheapos at 7-11 are crap, don't waste your money. The joyes are refillable and work well. Expect to pay about the price of a carton of cigs to get set up. after that, the refill 'juice' costs me about $10 a month. You can get different strengths of nicotine, and different flavors. Some folks will gradually reduce the nicotine level and then quit altogether. I am not one of those...I like my nicotine...so I continue to use the full strength stuff....but at least I am getting my nic without any carcinogenics or other toxics. check out ecigaretteforum.com for the "vaping" community. Not affiliated, but happy with cignot.com for my kit and supplies. The last place I worked, a guy used to use one. Never asked him how well it worked, but he seemed to use it regularly the entire year I worked with him so maybe that's an indication that it worked. To charge it, he had a USB adaptor that plugged right into the front of his desktop computer. I always found it amusing to see a desktop computer with a cigarette sticking out of the front of it. Best of luck with giving up smoking. I also had the Joye Ego. It worked good for me for a while. Then I got tired of the atomizers burning out or getting flooded. It still works and I think I'm going to give it a try again. Good luck. It's worth a shot. They have so many flavors to choose from you are bound to find one you like. I smoked 3 packs a day for almost 15 years and I quit. Getting over smoking and on to e-cigs was pretty easy. I started with a joye ego-t but if you smoke full flavored cigs, do yourself a favor and buy a nice kit. I now use an american made maxi roughstack v2 and I love it. There is alot to figure out as far as cartomizers/atomizers, voltages, and juices. Pm me if you have any questions. It cost me $25 at the Res. The kit came with one smoke, A/C charger, adapter for D/C charging and 20 cartridges (filters). The cartridges can be purchased separately and the buyer has the choice of strength - low, medium or high strength. If there is different flavors, well that's deeper into the subject than I ever got. If you are accustomed to smoking a light smoke or ultra light as I was and then you hammer away at the e-smoke with the high cartridge on it you'll probably find the smoke packs quite the wallop. I know I couldn't pound away at the e-smoke with the high cartridge on there. So for you guys that are into your Winston's straight up I would say the high filter should be able to give you what you need. edit: I was just reading above - this one has the USB adapter as well...so it can be plugged into the front of a PC as well. * I've seen some of these e-smokes with holes in them...the smoker has to put their finger over the hole to make the smoke work. A friend had one he bought out of the States somewhere...that hole was a royal pain in the ars! Last edited by Garett; 06-02-2012 at 07:22 AM. 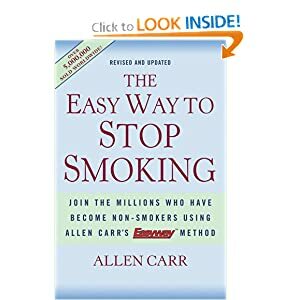 I read this book one evening and like millions of other very heavy smokers, I have never smoked again. The beauty of the book is that it encourages you to smoke while you read it. Have an open mind and no pre-conceptions about what is going to tell you, (it's not about cigarettes being bad for you, etc. etc.) and hopefully you will quit too. In fact, I didn't quit, I became a non-smoker. You can buy it for about $8-$12 online. Takes a couple of hours to read. Worth a shot, right?